We recently began carrying new yarns from two companies that specialise in hand-dyed yarns, Skein and Shilasdair, and, while we’ve carried hand-dyed yarns for a while, they are new to some of our customers- so we thought it might be useful to look at some of the joys and challenges of working with them! It’s definitely true that the things we love about hand-dyed yarns are often also the things that make them challenging to work with. Those beautiful shifts in colour that make us want to keep knitting just one more row just to see what happens next can sometimes overwhelm a stitch pattern, making it hard to see the lace or texture you’re so carefully working. And the fact that each skein is truly individual and one-of-a-kind means that colour variation between skeins can be difficult to manage, even within the same dye-lots. So what do you need to think about when using hand-dyes yarns? Basically there are three issues- choosing the right pattern for the yarn, avoiding colour pooling and smooth transitions when changing balls. It’s important to choose a design with a stitch pattern that is going to play to the strengths of your yarn. Textured stitch patterns, such as those made of slipstitch, knit-and-purl and brioche, are a great way to break up the colours in variegated yarns (these are yarns that contains more that one colour), allowing little blips of colour to stand out. The Supernova socks are a great example of a slip-stitch pattern that highlights the various colours in this yarn by bringing a knit stitch the the front of a background of purl stitches. The undulations of lace and chevron patterns can work well to highlight the colour shifts in semi-solid yarns (those that are made up of different shade of one colour) but can get a bit lost if used with too busy a yarn. “Pooling” is where a colour occurs in a similar place in successive rows, creating a blob or vertical/diagonal line of colour that stands out in a very obvious way. If you have a yarn with long stretches of colour, you won’t get this effect, as your yarn will form subtle stripes- it’s the variegated yard with short runs of colour that are likely to pool. Some people love it and spend a lot of time deliberately engineering pooling in their work- there’s even a group for it on Ravelry!- but, if you’re not going for that look, you need to know how to get around it. Pairing hand-dyed yarns with a solid color, or even another hand dyed yarn, to work Fair Isle, slip-stitch or even plain stripes not only breaks up pooling but creates impressive-looking colour patterns. 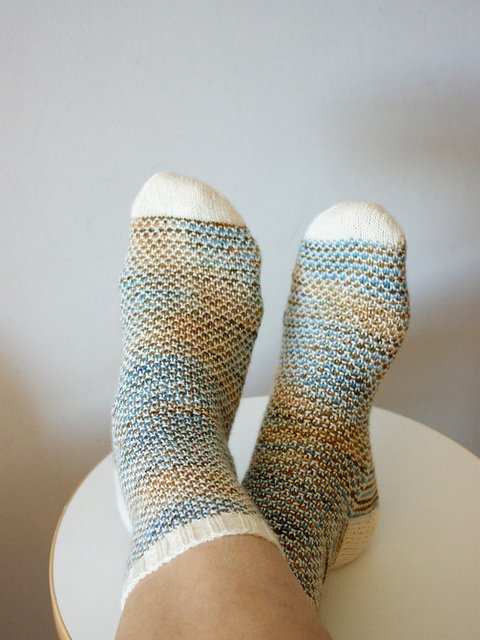 In these Broken Seed Stitch Socks, the combination of pairing a solid colour with a hand-dyed yarn and the use of a textured stitch really makes the the pooling recede into the background. But what about for a large project, such as a garment, where you don’t want to use texture or a second colour to avoid pooling? For simple stitch patterns such as stocking and garter, the best way to avoid pooling is to alternate between two balls of yarn. For working in the round, knit one round and then change yarns. For working flat, knit two rows and then change. You’ll need to start the second ball at a different colour from the second so that they can’t pool. And if you only have one skein? You just wind it into two smaller balls. You don’t need to cut your yarn at the end of each row/ round; assuming you’re changing every one or two rows, you can just carry the unused yarn up the side and pick it up two rows later. Keeping the balls in separate project bags prevents the strands from getting tangled, as does placing one ball to your left and the other to your right as you work. If you are making a cardigan and will be adding a button band later, just change yarns at the edge so that the little strands created through this process are hidden by the button band. If the button bands are worked as you go, change at the inside edge of the button band. Holding yarn doubled is another great way to avoid pooling, as long as you are careful to ensure that your two strands of yarn begin at different points in the colour repeat. Even yarns dyed in the same pot can end up different in the ball, which means that even if you choose your skeins very carefully and they all look the same, you may end up with an abrupt colour change when swapping from one ball to the next. To avoid this, you can alternate yarns as indicated for avoiding pooling for 6-10 rows. You’ll need to make sure you leave enough of your old ball to alternate with the new one- 12-20 times the width of your knitting should be plenty. So… we hope that these tips are useful for you! We certainly don’t want to make knitting with hand-dyed yarns seem like hard work and plenty of people do it without worrying about any or all of these things… we just want you to be happy with your end product! Do let us know if any of it is useful or if you need some advice. We’d also love to hear any tips you might have on working with hand-dyed yarns! Categories: In focus, Knitting, Perfect pairing | Tags: hand-dyed yarns, Melbourne knitting, Sunspun | Permalink. Thanks so much for this email. I’ve always loved the colours of hand dyed yarns but avoided them because I don’t like the look of colour pooling. I remember when Cleckheaton (I think it was Cleckheaton) brought out variegated yarns in the 70s and we all went mad knitting jumpers that even then ended up looking a bit daggy because the colours just didn’t ‘gel’ well. Guess I’ll be in soon…. Thank you, this is an excellent post on making the very best use of hand dyed yarn and avoiding those traps for young players. I particularly liked your suggestions for stitch patterns for hand dyed sock yarn.